Haptic display is a powerful sensory medium to transfer information that gives a sense of haptic. 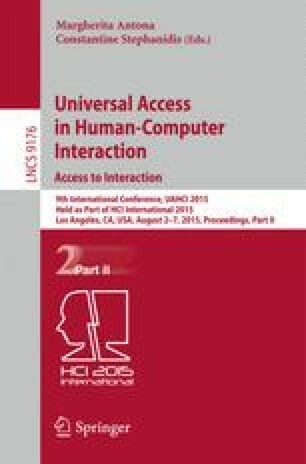 We argue that giving haptic information positively affects only when the haptic makes a good impression. We examine the best materials that people feel pleasant to touch. Consequently, people prefer textures with uniform grain of brush, cotton clothes and silk. Throughout this paper, we propose a new approach to design of haptic display using tactile preference. This work was supported by the MSIP (Ministry of Science, ICT and Future Planning) under the “IT Consilience Creative Program” support program supervised by the NIPA (National IT Industry Promotion Agency) (NIPA-2014-H0201-14-1002).